Throughout my life I’ve enjoyed creating art in many different forms. Art has always been a big part of my life. Art is always there. Art knows no bounds. Art speaks when I have no words to express myself. It speaks in a language common to every man. Art has brought me out of depression when I’ve felt I had nowhere else to turn. It’s helped me to express joy and happiness when I’ve felt it bubbling up inside of me. Art has guided me through the tough spots when I’ve been met with conflict and doubt. It’s soothed my soul when I’ve felt heartache and pain. It has lead me to answers when I didn’t even know the questions. Art isn’t just what I love doing, it’s who I am. 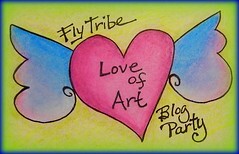 Love of Art Blog Party!